Do you always worry that the curious babies like to open the unsupervised windows or doors to get their destination? Do you always get mad that your naughty dogs always mess up your cabinets when you are not paying attention? Do you get tired of picks up the pieces again and again? Jeeco sliding door locks can help you solve all these problems. Easily stop your toddlers and pet opening any kinds of sliding doors or windows, such as washer, closets, garbage bin, TV cabinets, etc. Jeeco gives you the security to keep your baby safe and out of cabinets, drawers, toilets, appliances and more! No more chasing your baby around because they grabbed a sharp or hazardous item out of the drawer, no more picking up the toy from toliet which is throw from your baby! PEACE OF MIND HAS NEVER BEEN SO SIMPLE! 1. Adjust the straps to the right length. 2. Paste it on where you need and press tightly. 3. Push the fixed end to unlock. 1. Please clean and dry the surface you want to install before installation. 2. Please make sure the right length of the strap before installing and then locked. 3. After sticking, please rest it for 24 hours for better stickiness. 4. Please use glue-dispenser, cleanser or hair drier to help remove the lock. 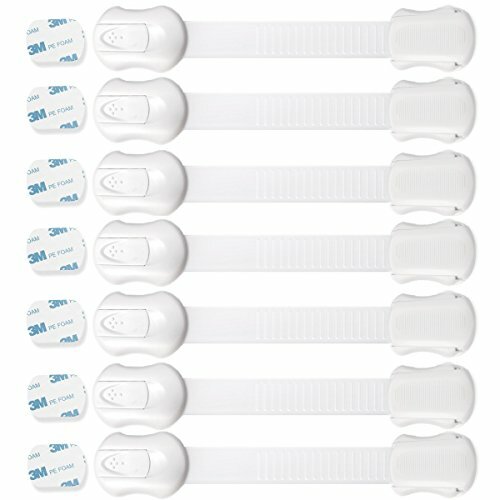 Wider Application: Comes with 7 pieces of cabinet locks, Securely shut your cabinets, drawers, washer,appliance, toilets, trash cans, windows, pet food containers & more. Keep your little ones away from all the dangers in your home. UNIVERSAL FIT & ADJUSTABLE LENGTH: The White color is too inconspicuous for babies to find and also matches your home decor. Flexible strap and adhesive back mean these locks work equally well on flat surfaces and around corners. Great for cabinets, windows, appliances and more. High Quality Material: Environmental ABS material is safe and nontoxic for humans and animals. 3M adhesive that will hold securely through the years and can be removed without marring walls or surfaces. They're also the perfect solution for apartments or rentals. ONE-HAND OPERATION: 5 MINUTE NO TOOLS INSTALLATION: Extremely easy for adults to open with one hand but difficult for your little ones to figure out. 100% MONEY BACK WARRANTY: Jeeco only uses the highest quality materials. Our products are factory tested and we are confident you will absolutely love them. If you don't, you are backed by our no questions asked, 180 day money back warranty! If you have any questions about this product by Jeeco, contact us by completing and submitting the form below. If you are looking for a specif part number, please include it with your message.